Wahoooooo! See you all tonight or tomorrow. Your tickets will be at will call at the Glowing Body Friday night. Sorry for any confusion about them being mailed or not. We mistakenly had bacon and eggs this morning at Mockingbird HQs. Need to save up for the weekend! Going to be working on decorations this eve. Hope to see everyone Saturday! Thanks!!! I gotta figure out how to get that pig cover drawing! Since Swine and Dine is sold out, it’s all about BaconBits now. What are you going to make? Be creative, go wild. Here are a reminder of all the rules and categories. In t-minus 2 days, IT IS ON. All dishes on the table by 7:45. This will be strictly enforced. Judges will be tasting the food before the general public, so they need time to taste. Dishes will be judged on the use of ingredient, taste, presentation, and originality. To enter each dish must have a recipe card and the origin of the cured pork or bacon must be noted. Best use of Bacon Grease: Leftover animal fat is an amazing tool. There was a while there where restaurants in New York were doing french fries fried in duck fat. 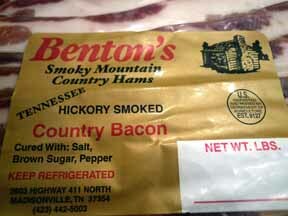 Iâ€™m curious what french fries fried in Bentonâ€™s bacon grease might taste like. Best Savory Dish: This category is wide open. Bacon goes with everything. The idea here though is to highlight some kind of cured pork. Wrap things, stuff things, braise things. Best Reinterpretation of a Traditional Recipe: Dig out one of your grandmaâ€™s classic recipes, reinterpret it, add in bacon, make it new. Most Creatively Paired Ingredient: Would bacon go will with peanut butter? What about buttermilk? Whatâ€™s the most tasty creative thing to pair bacon with? One final tip, the dishes donâ€™t have to be solid, if you are inspired to do a drink, bring it on. Mockingbird is excited that Salted Caramel will be sending down some of their Bacon Bourbon Caramel Corn for BaconFest 2010. From Ginna: This caramel corn is the handmade sweet and savory creation of Chef Ginna Haravon.Â Thick cut bacon shines among a healthy helping of Jim Beam Bourbon and golden delicious caramel.Â The popcorn?Â Popped the old fashioned way in a pot on the stove.Â Salted Caramel LLC, owned and operated by two friends in Chicago, is a very young company, experiencing national attention and amazing press including Chicago Tribune, ABC7’s “The Hungry Hound,” Daily Candy, TimeOut Magazine and UrbanDaddy. The Bacon Bourbon Caramel Corn will be a prize for the sweet competition category on Saturday night. Check out their website, support small artisanal businesses! Now the Swine and Dine courses. Our cooks have gone all out, or shall we say whole hog. 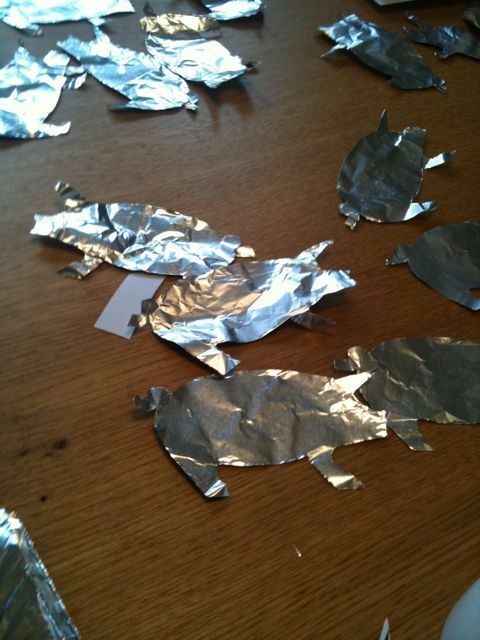 The pig puns have been running rampant over at Mockingbird HQs. From Holly Hambright, General Manager Nama Sushi Bar Bearden, Catering Consultant EOS Catering Swine and Dine diners will have Lobster Bacon “Bisque”, Bacon Wrapped Sea Scallop, Corn and Bacon Timbale. Dave McCauley and Chris Dufree Pitmasters for Q the Pig a BBQ Production will be serving smoked, bacon wrapped, stuffed peppers with a smokey, three cheese and bacon macaroni with a Strawberry Habanero sauce. Robert Birkholz of the Tomato Head, Maryville will be making a confit pork shoulder croquette with frisee, alan benton’s country ham, sorghum vinegarette and country ham/cola jus. And finally Meg Parrish and Lindsay Beeson of Craft and Spoon will present a dessert table of: Bourbon Bacon Caramel Corn, Bacon Toffee Ice Cream with Maple Cones, Bacon Toffee Bars, Sugar Cookies. We’ll end with bourbon from Downtown Wine and Spirits and Coffee from Java. MMMMM….We’ll have a full report once all the dishes have been tasted!